We left the banks along with the others. 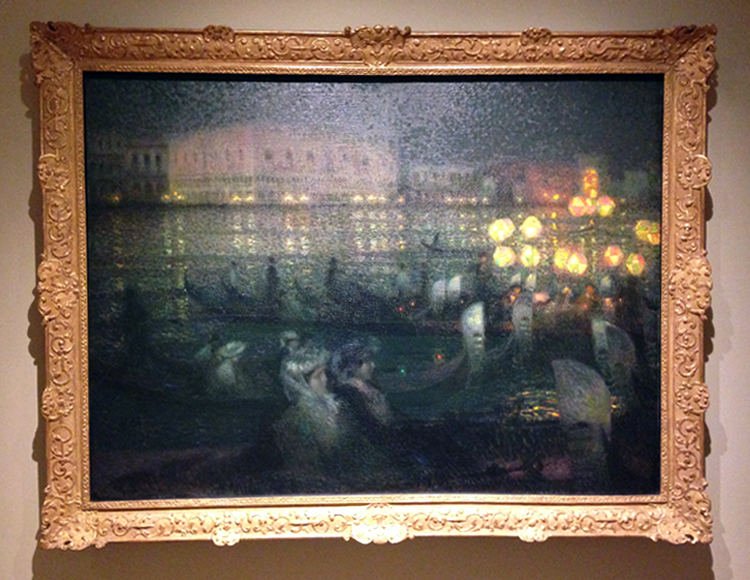 Each of us climbed, one by one, onto the gondolas and followed the lights. Although it was early summer, the nights were still cold. From the boats we could still see the banks of the Great Canal, the streets lit up with gas lights. Silence reigned; the only sound was the water gently beating against the hulls of the boats. We stopped and waited. Was it finally time? Across from us, in front of the Basilica, stood a group men holding onto objects. We waited. Time seemed slow. Eternity passed before we heard a faint echo of sounds, the vibration of the strings into the body of the violin. The rest of the orchestra followed, and Venice came alive with the sound of music. The landscapes on view in Seeing Nature can inspire any number of different emotions and reactions. Does one of the works from the exhibition stand out to you? Take a stab at your own freewriting exercise in response! Let your pen take the lead and send us the result at contest@phillipscollection.org for a chance to win a Phillips gift bag. We’ll feature our favorite submissions here on the blog. Here’s a previous example in response to Milton Avery‘s Dancing Trees. This entry was posted in Exhibitions and tagged basilica, cityscapes, free writing, gondolas, venice, waterscapes. Bookmark the permalink.